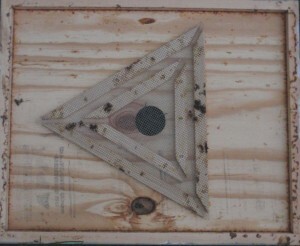 The triangle maze side of the bee escape board faces the brood chamber. Thankfully, I had two out of three hives produce surplus honey to harvest this year. Today I placed the bee escape boards on the hives. This article might make more sense if you understand how the Langstroth hive is used. The bottom boxes are called the brood chamber and are left on the hive all year. The queen is confined to the brood chamber by a queen excluder. The brood chamber is where she lays eggs. Boxes that are placed on top of the brood chamber are called supers. When the bees have surplus honey they store it in the supers. These supers are removed by the beekeeper to harvest the honey. The first step of any honey harvest is to remove bees from the honey supers. There are horror stories of new beekeepers that do not perform this step for one reason or another. This will result in lots of bees in the honey house. I have used two methods in the past to remove honey bees from their supers. 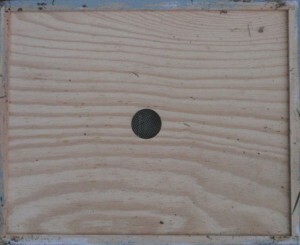 I have used bee escape boards and fume boards. The fume board was convenient when I harvested honey in July. The idea is to spray something that smells repulsive to bees on the fume board and then place the board on top of the hive. The bees will evacuate the super to get away from the smell. The method works well when it is hot and sunny out. I have tried two different products to repel the bees. One was based on butyric acid, the compound that gives rancid butter its smell. Butryic acid smells like vomit and I will never use it again. The second product was Fischer’s Bee Quick. This is an herbal based product that works very well. It smells like maraschino cherries. The large hole of the bee escape board faces the honey supers. The second method I have used is the bee escape board. I purchased mine from Brushy Mountain. The idea is to design a one way maze that the bees will have a hard time figuring out. The bee escape board replaces the queen excluder between the brood chamber and the honey supers. The large hole is placed facing the supers that are to be evacuated. The maze faces the brood chamber where all the worker bees will end up. The bees can exit the supers but have difficulty figuring out how to get back. When the temperatures are cool at night they will naturally want to move to the brood chamber to stay warm. After two nights the bees will have been removed from the honey supers. 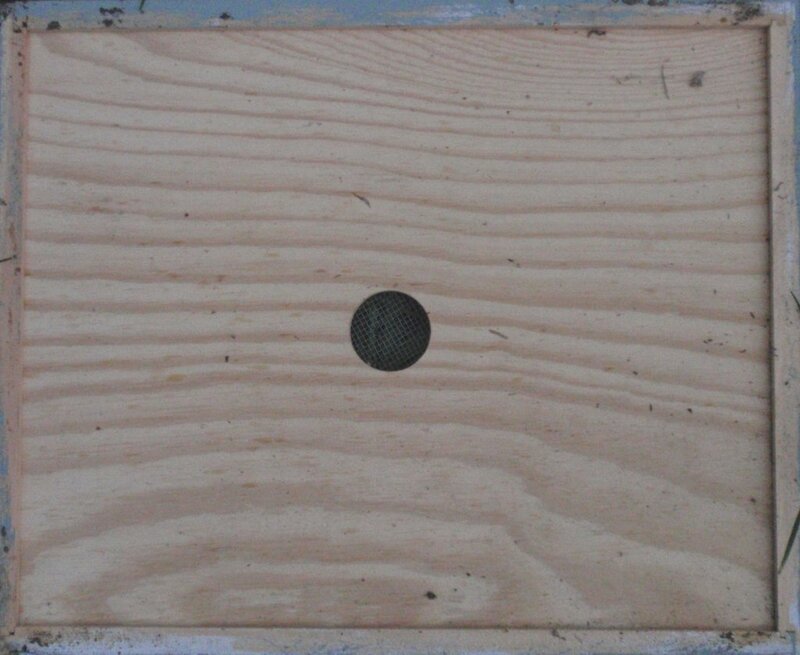 The advantage of bee escape boards is that it is a mechanical way to remove the honey bees and no chemicals are used. This method has worked well for me especially in the late summer when the nights cool off. The disadvantage is that all the honey supers have to be removed to place the bee escape boards. Then the supers have to be removed a second time after the bees have evacuated. This is impractical for someone with a lot of hives. I like to harvest the honey on Labor Day weekend because I usually have time off work. That means I have to place the supers on the hive after work on Wednesday or Thursday before the harvest. It is a general rule of beekeeping to never open the hive after dark. This is a self reinforcing rule. I got home from work late one time when I needed to put the bee escape boards in place. I ended up opening the second hive at dusk. The honey bees aggressively defended their hive by flying straight at me. I received more than twenty stings that night. I learned the hard way not to open a hive at night. Honey Harvest Step Four: Bottle The Honey Crop.